Home » Politics » Meeting Modi is fine Rahul, but why fake farmers and false phone numbers in your list? Congress Vice-president Rahul Gandhi met Prime Minister Narendra Modi Friday and submitted a list of demands made by farmers during his 'kisan yatra' in Uttar Pradesh. This was their first meeting after Rahul claimed he had information about "the personal corruption of the PM" that could cause "an earthquake". "Removal of import duty on wheat is a devastating blow. The PM acknowledged that the situation of farmers is serious. On my urging that farmers' loans should be waived, the PM didn't say anything. He simply listened," the MP from Amethi said. 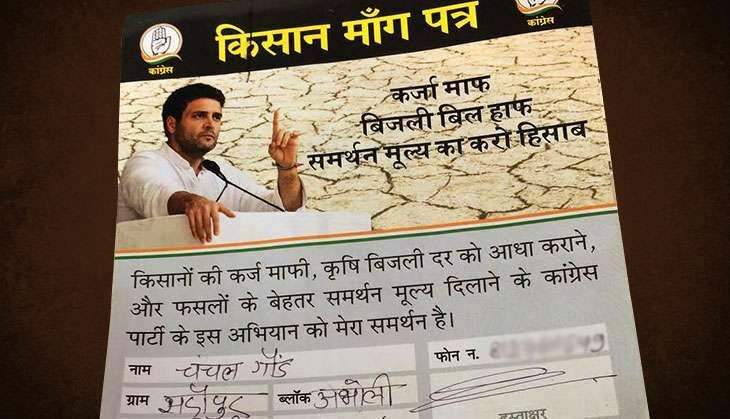 Earlier on Wednesday, the Gandhi scion accepted kisan maang patras (demand representations) from more than two crore farmers from UP and 34 lakh from Punjab seeking loan waiver, among other demands. According to the Congress, the forms were filled up by farmers from the two states. Rahul reiterated that on Wednesday. The exercise started during his month-long farmers connect programme in UP. However, it turns out that several of the kisan patras are fake and the phone numbers listed on them belong to people in Telangana, Madhya Pradesh, Chhattisgarh, among others. These people have no inkling how their numbers got into these documents with some even calling it a fraud by the Congress party. A closer look at these kisan patras kept at the lawns of the party headquarters revealed strikingly similar handwriting and signatures on most of them. The maang patras have various sections, to be filled by the farmers, seeking information like 'name', 'phone number', 'village', 'block', 'district', 'loan amount' and has a space for their signature. To seek more clarity, Catch dialled some of the numbers listed on these kisan patras and found out that they were not from UP or Punjab. For example, a kisan patra in the name of Pradeep Kumar from Sadna village of Kanpur district turned out to be the phone number of a government servant in Chandigarh. Similarly, Janaki Dulari from UP turned out to be Ramesh from Ahmedabad who has nothing to do with farming. "I am an Ahmedabad based trader and don't know how my number came in that document. It must be some kind of fraud". Rajendra turned out to be Bunty from Gwalior; Kapoori Devi's number was picked up by a man from Telangana; Snehlata too happened to be a man from Indore; Pushpa Devi, a man, didn't reveal his name but said he is from Maharashtra. Catch dialled close to 15 numbers listed on these maang patras and not even one was from UP or Punjab. These numbers belonged to people from Telangana, Rajasthan, Madhya Pradesh, Maharashtra, among other states. The other interesting part about the maang patras is that the signatures are almost identical in most of them, with the first alphabet of the name written inside a circle. So Pradeep Kumar's signature had P inside a circle, Guru had G, and so on. Even the representations from Punjab had strikingly similar handwriting and signatures. A Punjab Congress worker, on the request of anonymity, confirmed how he was asked to fill 7000 such forms but he filled 700. "When a party functionary asked why I didn't fill all 7,000, I told him that I couldn't," he informed Catch. While speaking to the media on Wednesday, after accepting these representations, Rahul Gandhi had said that Congress workers toiled hard and collected these maang patras going door-to-door. He also added that they will soon be handed to the government. Earlier in September, Rahul Gandhi went on a 3,500 km long kisan yatra in UP and visited 48 districts covering 141 assembly segments in 48 days to revive Congress' fortunes in the state. The entire campaign was designed by Prashant Kishor and even the decision to have kisan maang patras was his brain child. Earlier this year, Congress had given all responsibility of campaign to Kishor who was literally running the show in UP which irked several top leaders eventually leading to Kishor's limited role in UP. Even the decision to raise farmer issues like loan waiver, reduce their power bills to half, and help them get remunerative price for their produce was Kishor's idea. At the start of the kisan yatra from Deoria, Kishor's team was tasked to get these maang patras filled by farmers in every district where the Congress vice president went. The idea was to get 25,000 such forms filled from every block which will help Congress achieve a target of 2 crore from the state. Catch tried reaching out to Kishor, but he didn't respond to any of the queries we put forward. Even UP Congress president Raj Babbar didn't respond to calls and messages. But, it seems in their efforts to reach these targets, Congress workers filed in fake details of people which should be a major embarrassment for Rahul and UP Congress Committee. Even if this was done by members of Prashant Kishor's team, the onus lies with the Congress to ensure genuineness of these forms which were to be submitted to the prime minister. If all these maang patras turn out to be fake, one wonders what explanation will Rahul have? Also, Prashant Kishor would have a lot of explaining to do to the Congress party leadership.